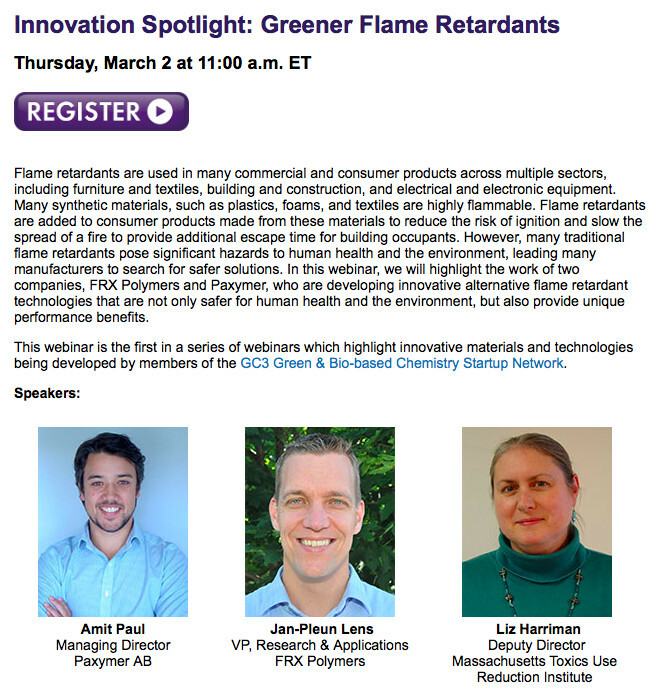 Paxymer, FRX Polymers and Massachusetts Toxics Use Reduction Institute gives webinar on “Greener Flame retardants”. The webinar is hosted by the GC3 and targeted to companies aiming to take control of their use of hazardous materials. It is the first in a series about innovative green materials and and technologies. Legislation and new standards are increasing pressure on companies designing and marketing products. Increased producer responsibility and stricter chemicals legislation is creating a push for new innovative solutions within challenging application – flame retardants is one such application. The Green Chemistry & Commerce Council (GC3) is a cross sectoral, business-to-business network of companies and other organizations working collaboratively to accelerate green chemistry across sectors and supply chains. Started in 2005, the GC3 has over 100 members from leading companies and other organizations. The series of webinars hosted by the GC3 will give users of materials tools to take control of their supply chain by giving examples of cutting edge technology in challenging sectors. 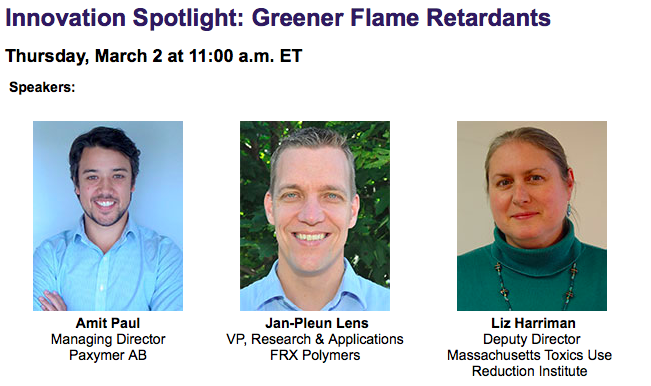 The seminar on Greener Flame Retardants will be held March 2nd (17:00 CET or 11 am ET). The webinar was recorded and is available here. The webinar will be introduced by Liz Hermann from Massachusetts Toxics Use Reduction Institute who will give a background and overview of the functionality of the different technologies today. Paxymer and FRX Polymers will present their their technologies and their latests advances aiming to provide special relevance to consumer products. The two companies cover most of the halogen-free flame retardant market between them. Paxymer is a novel technology developed for achieving flame retardants in polyolefin plastics. FRX is focus on engineering plastics and thermosets with a polymerised phosphorous based technology.